KMX Performance Series Introduces You to the Ride of a Lifetime! The KMXperience has just shifted gears. Our three all-new Performance Series models offer a rush of adrenaline-pumping performance and deliver a high-octane ride like never before. Three different performance models offer a balance of performance and price, with frames to fit both male and female riders. The Cobra lets riders take a bite out of the road with an entry level karting experience. 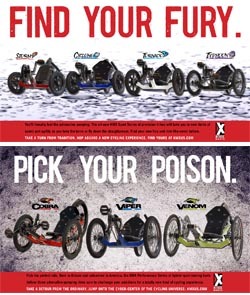 Viper provides adult performance karting that doesn't compromise on performance. And the Venom offers our greatest ride ever, combining sporting style and race components. Reengineered angles increase ground clearance, which combine with a low center of gravity and three point stability for a superior ride. Precision components from Sram and Avid deliver unparalleled cycling and braking performance. You'll ride in true comfort with hardshell seats that are intercooled for a breathable and enjoyable ride. Sit back and enjoy the sensation as our KMX custom made hubs and hand built wheels make you feel like you can roll on forever. The new KMX Performance Series is also perfectly finished with our own Shark Fin front boom, black anodized aluminum parts and deep luster professional paintwork and finish. KMX SPORT SERIES OFFERS FOUR NEW CYCLONIC RIDES! Cycling has just taken a turn for the better. All thanks to the new KMX steroid-fed sport trikes. These four new models kick it into gear with a host of performance-enhancing features that offer a new twist for adventurous cyclists of all ages. The KMX Sport Series delivers speed and agility at a price that won't ride you into the poor house. Rush onto the karting scene with our entry-level Storm. Young people will enjoy getting to know the KMX on a Cyclone. Our Tornado gives adults a way to make their entry with a kart that really performs. And the Typhoon provides a head spinning ride, with the ultimate in sporting performance and comfort. From basic to advanced, the KMX Sports Series is all about serious cycling energy. The double pulley system delivers smooth chain management. Reengineered angles for increased ground clearance and low center of gravity creates an incredibly stable ride. You'll ride in true comfort with a variety of seats that include an intercooled and adjustable design for a comfortable and enjoyable ride. We know you'll want to sport the pure beauty of your new KMX. Show off the pro luster finish and, with select models, you'll ride in style with Sram shifters, Tektro brakes and black anodized aluminum parts. Hey, obsession is OK. Go ahead and take your sport to excess. All KMX Karts will be available for delivery in April 2008.